Scientists have begun an eight-day mission, in which they are living and working at 60 feet below the sea surface, to determine why some species of coral colonies survive transplanting after a disturbance, such as a storm, while other colonies die. Coral reefs worldwide are suffering from the combined effects of hurricanes, global warming, and increased boat traffic and pollution. As a result, their restoration has become a priority among those who are concerned. Using as a home base the National Oceanic and Atmospheric Administration's Aquarius--an underwater facility for science and diving located in Key Largo, Florida--a team of "aquanauts" is working to protect coral reefs from this barrage of threats by investigating ways to improve their restoration. "It's like living on the space station, except that it's underwater," said Iliana Baums, an assistant professor of biology at Penn State and a collaborator on the project. "The job is dangerous because, once the aquanauts descend, their tissues become saturated with nitrogen. If they were to return to the surface quickly, they would get the bends--an often deadly illness in which tiny bubbles form inside the body. As a result, the divers at the end of their mission must spend an entire day depressurizing by making their way to the surface slowly." A molecular ecologist, Baums is providing the genetic expertise that will reveal whether particular coral colonies contain forms of genes that allow them to survive transplantation and other stresses, such as increasing sea temperatures. The team has collected hundreds of coral fragments from two species: staghorn coral--which is listed as threatened under the United States Endangered Species Act--and a type of star coral that is common throughout the Caribbean. "We carefully designed the experiment in order to minimize its impact on natural populations," said Baums, who added that one of the collection sites was slated for development, and the corals there would have died anyway. The researchers are splitting each of the fragments in half and placing one half in a shallow site (30 feet deep) and the other half in a deep site (60 feet deep) to see how they respond over time. "By splitting the fragments, we know that they are the same genetically, and we then can determine whether their abilities to withstand transplanting are due to their genetic makeup or to some environmental factor," said Baums. While her colleagues in Aquarius transplant corals into the deep site, Baums and Margaret Miller, a scientist with the National Oceanic and Atmospheric Administration (NOAA) and the project's leader, are transplanting corals into the shallow site. Once the animals are established, the team will return to the sites monthly to measure, among other things, the corals' growth rates, their photosynthesis rates, and the biodiversity of the beneficial algae that live inside their cells. 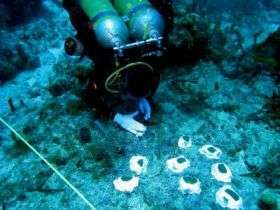 The scientists expect that the study's results will help them to improve coral restoration efforts in the future. "The experiment will tell us why some corals die while others live after transplantation," said Baums. "We want to know if some corals die after transplantation because they already were weakened by an external force or because they are genetically weaker than some other individuals. Coral reefs are important because they protect our shores from wave action and create habitat for fish, but they also are beautiful. I am glad that I am able to apply my scientific expertise to their protection."